Are you and your furry friends dreaming of warmer weather and planning the places you are going to explore this summer? Whether you and your pet plan to visit the beach or the mountains, you’ll want to make sure you travel safely together on the way there! Take a look at these top ways to ensure your dog’s safety while traveling to your next adventure, from the safest dog crate for car backseat to doggie harnesses and seat belts that keep your pet secure. Whichever safety mechanism you choose, remember that the back seat is always the best place for your furry friends to ride. Just like child safety seats, dog crates, harnesses, or other safety gear should be secured in the back of your vehicle for the safest ride, in the case of an accident, and to help reduce distractions and keep your eyes on the road! A crate is the best way to ensure your dog rides safely in a moving vehicle is to purchase a pet travel crate. There are many options to choose from, including travel crates that have been vehicle crash tested. Once you pick the right travel crate and secure it in the back seat of your vehicle, make sure your dog has comfortable bedding and good air flow inside the crate to help keep him or her relaxed and comfortable on your journey. Your dog should be able to stand up and turn around inside the crate, so make sure you select one that is the right size! For small dogs the Sleepypod Mobile Pet Bed is a comfortable option that fits snugly in your car’s back seat and has been crash tested to ensure your pet’s safety. For larger dogs, a good option is the Petmate Vari Kennel for a safe ride in the back seat. To help your dog relax on a long trip, introduce them to the new crate before you go, allowing them to sleep and play in it for days in advance, and cover the travel crate with a blanket during the trip to block out sounds and light. Does your dog NEED to look out the car window at all times? One simple but effective safe travel option for shorter trips is the back seat barrier, which keeps your pet away from the driver, and safely in the back of your vehicle. This option is best for dogs who don’t like to ride restrained inside a moving vehicle. Make sure the barrier is securely installed before you begin your journey! One low cost barrier option is the Stalwart Pet Safety Barrier for Cars. For a more deluxe version, check out the Bushwhacker® – Paws n Claws Dog Barrier. One of the simplest ways to keep your dog securely in the back seat during a car trip is with a dog safety seat belt. These are a type of dog leash that fits into your car’s seat belt slot and then clicks easily onto your dog’s collar, keeping them restrained safely in the back seat of the vehicle. They fit any size or model vehicle, or dog! Make sure you choose an adjustable dog safety seat belt and adjust the strap to the right size to keep your dog securely in the back seat before you start your trip. Check out the Duke & Dixie Dog Seat Belt for a low cost safety seat belt option. Similar to a seat belt, another way to keep your dog secure in a moving vehicle is with a zip line car seat harness. These safety harnesses are very easy to install, fitting securely between any two points in your vehicle, including two seatbelts or two side ceiling handles. Securing your dog with this safety option will allow him or her some freedom of movement throughout the back seat, but prevent jumping into the front of the car, or out of the car when the door is opened. It will also help keep your pet from distracting the driver of the vehicle. One simple harness option is the Kurgo Dog Seat Belt Pet Safety. If you want your dog to ride in comfort and style, try a backseat hammock! This safety tool will help keep your dog in the back seat and ensure he doesn’t fall off during a bumpy ride or sharp turn. This option is great for dogs who like to lie down during their journey. The hammock will also protect your car from scratches, dirt and spills during the trip! 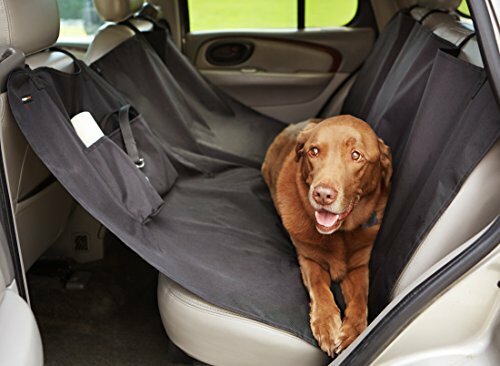 Check out the AmazonBasics Seat Cover for Pets for a stylish hammock to protect your pet and your back seat. Another safe and stylish option is a pet car seat. These safety seats are padded and secured to the back seat of your vehicle for an extra soft ride for your pet, and help smaller dogs see out the window. 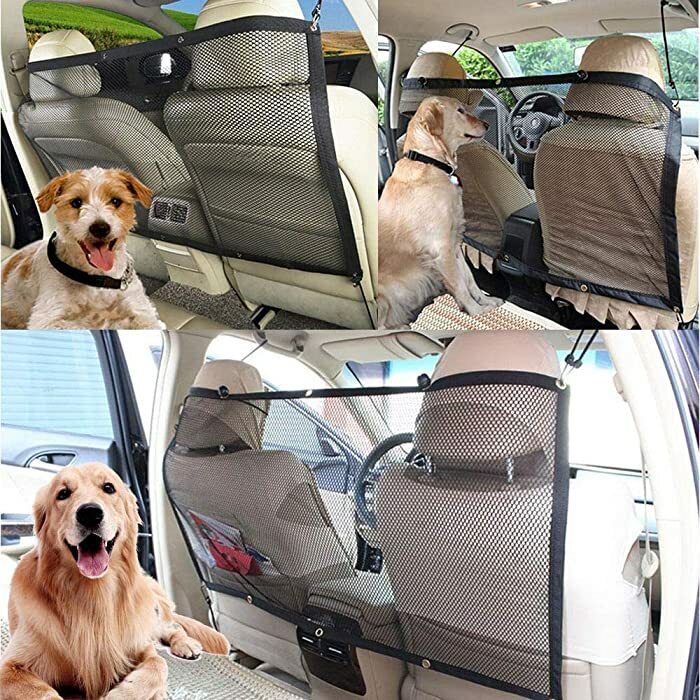 They are very easy to install, and most are washable, providing a safe, clean way to keep your dog secure in the back seat. Pet car seats are best for smaller dogs, under 20 lbs., and they provide a short leash secured inside the car seat to keep your pet inside. One stylish option is the Petlo Dog Booster Car Seat with Soft Luxurious Fleece. 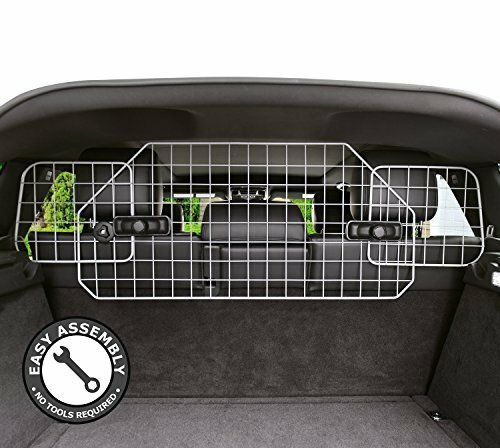 If you own an SUV or crossover vehicle, it may already come with a cargo guard to keep pets and other valuables securely in place in the back of the vehicle. If not, you can purchase an easy-to-install cargo guard that fits most SUVs and hatchbacks. This safety option provides larger dogs with a big space to move around but prevents them from entering the front of the vehicle or being thrown forward during a crash or sharp turn. 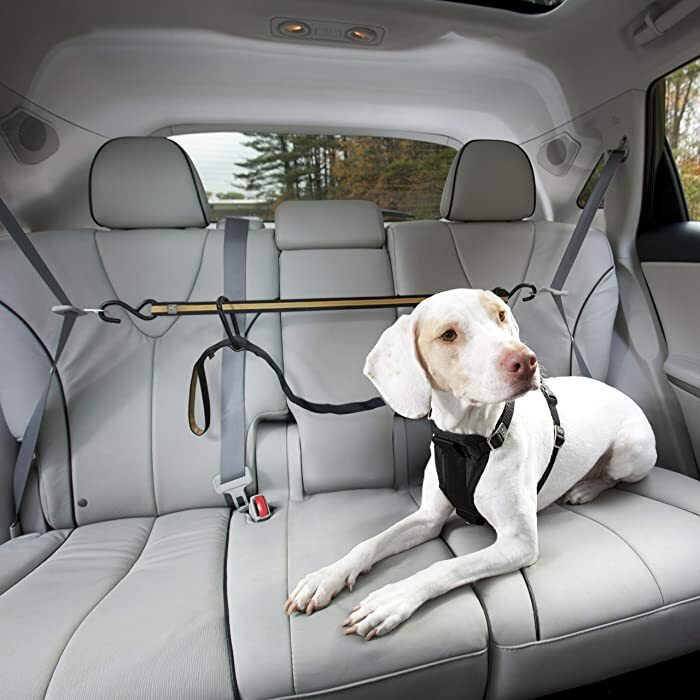 Look for an adjustable guard that will fit securely in the back of your vehicle and consider purchasing a ramp to help your dog get in and out of the back of the car or SUV easily. Check out the Jumbl Pet Dog Barrier for SUV’s, Cars & Vehicles. Whether you’re planning a long trip, or just traveling to the dog park across town, these safety tips are a must to help secure your pet and ensure a safe and happy trip for you both. When traveling, make sure you bring your dog’s favorite toys and the right amount of food and water to keep your pet safely hydrated and comfortable in his or her new surroundings. And please remember to never leave your pet alone in a vehicle, no matter what the temperature is outside — safe travels!